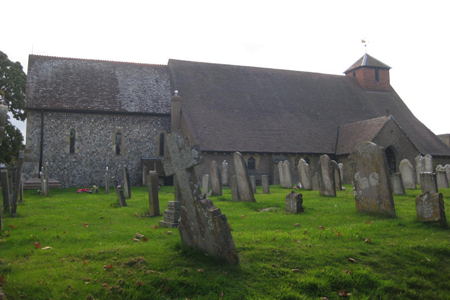 The church: St Andrew's, Ferring, West Sussex, England. Denomination: Church of England, Diocese of Chichester. The building: One of the oldest churches in Sussex. The current building dates back to 1120 and the west and south walls remain from that period. There is only a north aisle, while on the south side a vestry was added in the 1950s. It has been suggested that the current porch may originally have been the base of a tower. This might account for the blocked-up doorway in the east wall, which may have led to the belfry. Today only a single bell remains, but records show that there were at least three at one time. The interior is unusual in that it has been re-ordered to place the choir stalls nearer the organ. On the south pillar of the chancel arch there is a bracket for a sermon-timer hourglass, sadly stolen in the 1970s – a reminder of the times when sermons lasted hours rather than minutes! Most of the windows are plain glass, thus giving the sanctuary an airy, light and spacious atmosphere. The church: The prominent notice board outside proudly announces that this parish church has served the local community since the early 12th century. The parish magazine gives the impression that it is still very much at the centre of community life. They entertain close links with the local Baptist church and support many charities. There is the usual mix of groups catering for all ages and needs – from a toddler’s group to regular Bible study. The neighbourhood: Ferring remained a hamlet into the early 20th century, when social mobility and the railways brought visitors to the south coast and created demand for housing. Today, sadly, Ferring has fallen victim to the urban sprawl, with houses back to back almost all the way from Littlehampton in the west to Brighton in the east, though it claims to maintain a village character. Just to the north of Ferring lies Highdown Hill with the spectacular Miller’s Tomb, a popular location on the South Downs for dog owners and walkers. High Salvington Windmill, a restored post mill in full working order, is also close by. The cast: The Revd Gary Ingram, priest-in-charge. The readings were done by Boy Scouts while the prayers were read by Brownies. The children also helped with the collection during the offertory hymn and brought all the harvest offerings to the front. The date & time: 3 October 2010, 9.30 am. Packed. It seems to be a custom here to count the congregation in as they gather for worship and then announce the number. It was annouced that the church was "198 at the last count." A number of pews at the front were reserved for Scouts: Cubs, Beavers, Brownies and Rainbows. There was a goodly number of other children present as well. The priest was standing on the path outside his church chatting away to his parishioners. As we came in we were handed a service sheet and a pew sheet with the usual notices. The stars of the show were undoubtedly the children; we felt wonderfully unobtrusive. 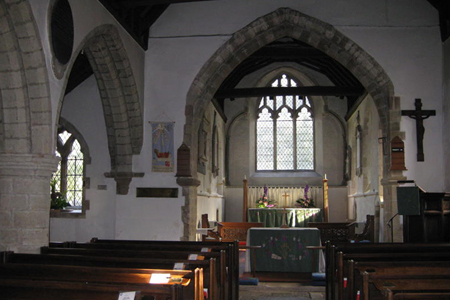 Standard pews, some with a thin cushion covering the length. There were embroidered hassocks as well which were much better padded than the seat cushions. The place was abuzz. This was obviously a lively and joyous occasion. "In the name of the Father, and of the Son, and of the Holy Spirit." The "in" was intoned in such a way into the general buzz ("iiiiiinnn...") that I was thinking this was going to be an introit sung by the vicar. It came somewhat as a disappointment that it was no such thing. No books were used during this service; rather, a service sheet and pew sheet with hymns and notices were employed. Keyboard, three acoustic guitars, clarinet, flute, snare drum and cymbals. The band members covered a wide age range, from a young Scout in uniform to an eminent grey-haired lady at the keyboard. There was no time to get distracted as it moved at a furious pace. The only fly in the ointment was that the audio loop had a few black spots so that the vicar switched off the microphone altogether and proceeded "au naturel." Wacky – as gloriously un-Church-of-England as you are ever going to find around here. Although the style was not happy clappy, there was a total absence of the formality that characterises regular Sunday worship everywhere in the southeastern Anglo-Catholic stronghold. The only recognisable feature of the ordinary middle-of-the-road (staid) CofE worship was an off-the-peg "children of the world" chasuble worn by the priest. He played to the congregation, thrusting the microphone under their noses to elicit answers and even casually exchanging a bit of banter with his mother. I completely forgot to time the sermon. It was relatively long, about 20 minutes, but it was still too short, as it did not feel like a sermon, but more like a performance. The whole congregation was in stitches throughout. 10  The vicar is clearly an eccentric character – in the true sense of the word. All out-going. This was no ordinary sermon. He roamed up and down the aisle, addressing most of the talk to all the children present. The adults, I think, were mostly grateful not to be asked about their favourite foods, or what they like to have, and whether or not they share, etc. He began by referring to the day's readings: Philippians 4:4-7 ("Do not worry about anything"), which means that God does not want us to worry, or at least not as much as we do; and John 6:27-35 (Jesus is the Bread of Life), which speaks of nourishment, of fulfilment in Christ, the reason why we come to church in the first place. "But that is not the sermon," he suddenly declared. Instead, he called several children to the front and handed them giant letters that spelt the word "HARVEST." Another child was given the task of arranging and rearranging the letters into words as directed. Those words were "vest," "eat" and "have." God provides everything for us. We should say (with more rearranging of the letters) "ta" for his "earth". We should "share," because if we don’t, people will "starve." To God all people are equally valuable, whether life gives them a bashing or not. To illustrate this, the vicar took a crisp new £20 note from his wallet and then proceeded to crumple it up, stamp on it, rub it along the whitewashed wall, and finally tear it half-way through. After all the battering it got, we were told it was still worth exactly the same as before. The whole atmosphere. Was this really "church?" I was waiting with baited breath for the £20 note to be torn and shredded completely to show our wastefulness in the face of God’s provision. As the harvest offerings kept coming in we had to sing through the opening hymn ("We plough the fields...," never one of my favourites) twice and start a third time. Surely it was foreseeable that three verses would never suffice on an occasion like this. And the band could do with some better acoustics. Get them a good amplifier! I wish I could have stayed ,as this is clearly a happy place. As it was, we had to rush and almost barge our way through the queue waiting to shake the vicar’s hand and exchange a few words. We were advised that the food we would see in the adjacent hall was the harvest lunch and by ticket only (sold out, naturally). However, coffee and biscuits would be available to all as usual. 8  This is not my regular style of worship, and in my parish you would never get away with not celebrating the eucharist at least twice on any Sunday. However, if I lived closer I would definitely attend this monthly family service, as we were told it is always like this. I felt like laughing all the way home, and I parted with more money than I usually would on my Mystery Worshipping tours. The abuse given to the £20 note.